Raise the back leg up and extend through the foot. Try to horizontally align the hips. The hamstrings need to be flexible. 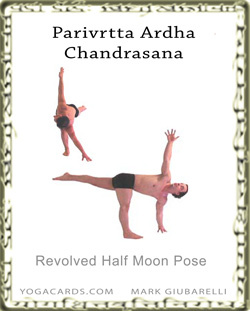 Raise one arm up to create a rotation in the spine and gaze up at the hand. This pose will strengthen the muscles necessary to perform Warrior 3. Try to visualize straight lines of energy moving through the arms and across the spine up through the foot behind you and the top of the head. stronger. The arms and shoulders become stronger and the muscles needed to rotate the spine become more flexible. This is a nice posture to enter after standing spinal twists. It blends very well in classes and students can learn with both hands on the mat until confidence and balance is gained. 2. Instruct the name for your advanced students so they can enter swiftly. 3. Only a few seconds will have passed for the previous instructions so we can go on to describe how to enter the pose for the beginners. Start with the placement of the hands and allow them to place both on the mat before instructing them to raise one leg. Then give them the option of raising the other arm. Instruct the arm position and foot position in whichever way you prefer. (The feet, toes or ball points of the toes can be pointed, the arm has many possible positions.) A block can be used if the hamstrings are not flexible. You can allow the supporting leg to bend if you are moving fast or don’t have blocks. 5. Go on to talk about the form in more detail. The weight on the grounded foot. The alignment of the hips. The position and rotation on the raised leg. 6. Talk about the benefits of this pose. 8. Try to bring peace to the students minds and remove any suffering the posture may be causing.